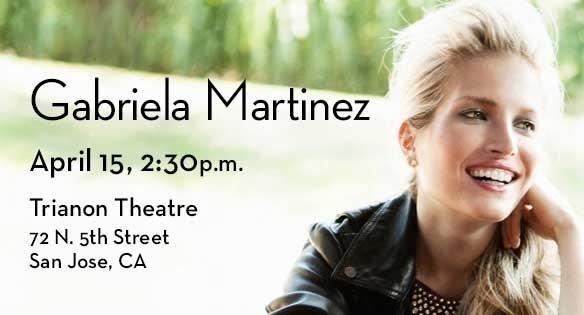 SAN JOSÉ, CA – Presented by the STEINWAY SOCIETY in a single concert, captivating pianist Ms. GABRIELA MARTINEZ returns to the Bay Area for a solo recital at the TRIANON THEATER. The young, and versatile artists who feels at home interpreting a contrasting repertoire of Classical and Contemporary composers ranging from BEETHOVEN, to RACHMANINOFF, to ADAM SCHOEMBERG Ms. GRABRIELA MARTINEZ had already established a reputation not only in VENEZUELA, where she is from, but in the international stages for her interpretations of her music,her “touch” on her instrument, and the lyricism of her playing. 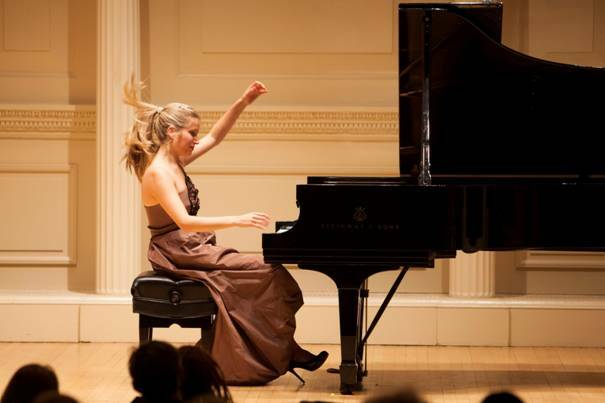 The young pianists have been captivating audiences around the United States and abroad. Some of her recent performances have included debuts with the Boulder Philharmonic Orchestra, the Buffalo Philharmonic Orchestra, and the Delaware and Jacksonville Symphony Orchestras, as well as engagements with the Houston, Tucson, Pacific, West Michigan, Stockton and Texarkana Symphony orchestras, the National Philharmonic and the Wisconsin Philharmonic. Among the highlights of her 2017-2018 season, will be debut appearances with the DAYTON Philharmonic and the Akron, La Crosse, Modesto, Rogue Valley, Springfield (MO) Topeka, and Wichita Symphony orchestras. In the past, and outside the United States, she has performed with Canada’s Victoria Symphony,Orchestra and with the Costa Rica National Symphony. Ms. MARTINEZ is also well-known in the Orchestra circle where she has played with the San Francisco, Chicago, Houston, New Jersey, Tucson, and Forth Worth, Symphonies in the United States, in Europe with the Germany’s Suttgarter Philharmoniker, MDR Rundfunkorchester, and Nuremberg, and In South America with the Simon Bolivar Symphony Orchestra, in Venezuela. She had also performed under a number of distinguished conductors. Ms. MARTINEZ began her piano studies in CARACAS, VENEZUELA, with her mother, ALICIA GAGGIONI, and made her orchestral debut at the age of seven. She then emigrated to the United States where she attended the famous JUILLIARD School of Music in New York, where she had the opportunity to study with YOHEVED KAPLINSKY, and where, in a full scholarship, she earned a Bachelor and Master Degrees. For those interested in listening to her marvelous piano technique, in November 2016 Delos released Ms. MARTINEZ debut solo Album Amplified Soul in which she interprets a wide-range program featuring works of BEETHOVEN, RACHMANINOFF, SZYMANOWSKI and acclaimed contemporary composers, DAN VISCONTI and MASON BATES. Among other awards, Ms. MARTINEZ was the First Prize winner of the ANTON G. RUBINSTEIN International Piano Competition in Dresden, and a semifinalist at the 12th VAN CLIBURN International Piano Competition, where she received the jury Discretionary Award. TICKET INFORMATION: www.steinwaysociety.com or call 408 990-0872.